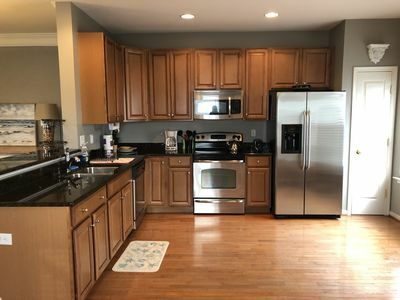 Well-equipped kitchen with two wine coolers, large refrigerator, six-burner gas cook-top, wall oven, warming drawer, built-in microwave, two dishwashers, coffee and espresso maker and everything else you need to enjoy your vacation if you choose to cook at home. Large island with Carrara marble and plentiful storage. 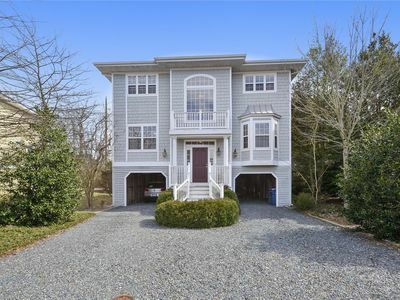 It is ideally sited on a half acre corner lot and extensively landscaper to provide privacy. 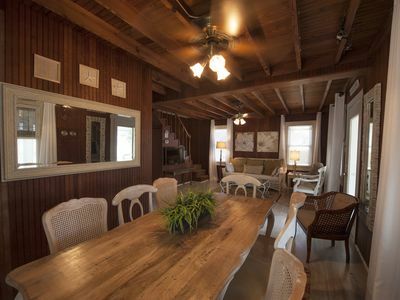 Technology - the home has wireless internet, fully wired throughout for music, televisions and cable in living room and all bedrooms. 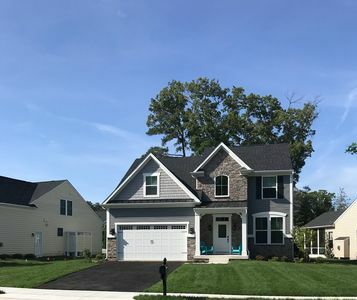 The basics - four bedrooms, three full baths, stone floors and soaring ceilings. 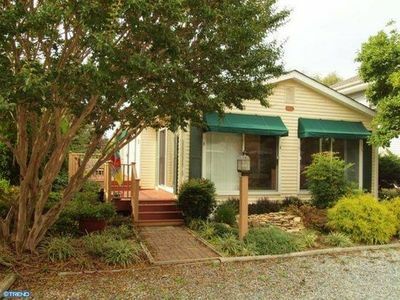 The master bedroom has a king bed and opens to a wonderful screened porch. Two of the guest rooms open to side terraces and the fourth bedroom has a queen bed but is a bit smaller than the other two. Slate floors throughout. Multiple private terraces with gorgeous furniture around the house and pool for relaxing and dining. 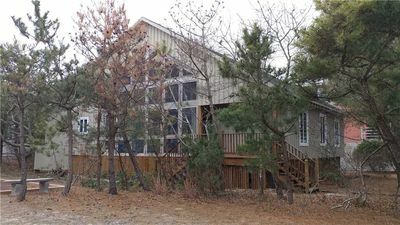 Two large porches, one off the master bedroom and the other off the dining room. The home is equipped with everything you need to enjoy your vacation – gas grill, beach chairs, an expansive book collection and much more. 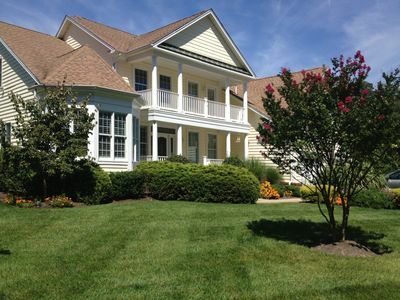 UPDATE - the home is featured in the June 2014 issue of Delaware Today. Ken Sugarman and Tommy Llewellyn know that great architecture is the ultimate geometry lesson, a pursuit that combines lines, surfaces and dimensions. Both partners are design pros. Sugarman builds and renovates high-end homes in the Washington, D.C., area and at the Delaware beaches. Llewellyn is an architect for the World Bank. 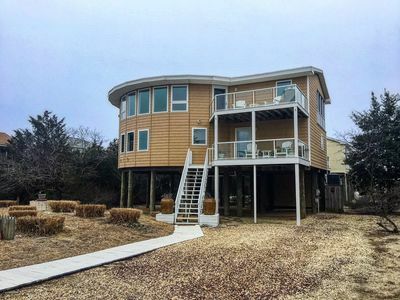 When they built their own retreat in Rehoboth Beach, the couple turned to Hugh Newell Jacobsen, an architect who is known internationally for his modern, pavilion-style residences, including the home on Martha’s Vineyard he designed for Jacqueline Kennedy Onassis in the 1980s. Every year, the professional journal Architectural Record chooses the 15 best new houses in the United States. Jacobsen has won the honor 20 times. “We knew that he would design a wonderful, one-of-a-kind home for us—and he has,” Llewellyn says. Essentially, the house is designed on a geometric grid in which architectural elements add up to the number 16. The stone pavers on the floors are 16 inches square. The large windows and doors on the back of the house are eight feet wide, which is 16 divided in half. The result is harmonious flow free of friction, a subliminal invitation to relax. Like their house, the homeowners are blissfully compatible in their design aesthetic. Both partners envisioned a sanctuary with spare surfaces, crisp angles and a monochromatic palette of various shades of white. “We are very simpatico,” Sugarman says. To make clean-lined white cupboards in the kitchen, the couple commissioned Oceanic Ventures, a cabinetmaker in Lewes. Custom storage enables the homeowners to corral clutter and keep the kitchen sleek. 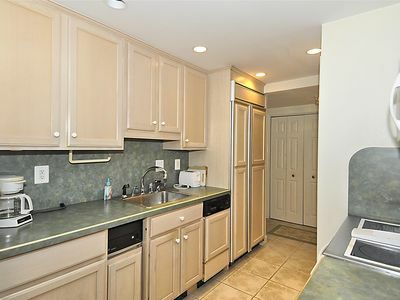 A washer and dryer are hidden behind doors under the counter. The couple chose Carrera marble for the countertops in the kitchen and baths. The stone’s milky tones and silvery veining are a subtle complement to stainless steel appliances and chrome fixtures. “Repeating materials helps to make a home feel cohesive,” Sugarman says. Vintage waterman buoys are mounted on walls to add rustic pops of color. The couple discovered the bright turquoise and red sign advertising Esther Williams swimming pools at Pelican Loft, a shop in Rehoboth that specializes in salvaged furnishings and architectural elements. Left: The master bedroom, like the rest of the house, is done in various shades of white. Right: A pair of pavilions are transformed into open-air bars when the couple entertains. In the gathering area, furniture is placed away from the walls, creating an aura of breathing room, a feeling of spaciousness. In a previous, more traditional incarnation, the sofa was upholstered in a floral print. This time around, it’s covered in soft white, with tailored gray piping. 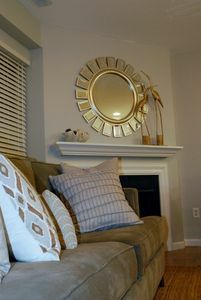 To give the piece more contemporary lines, the couple replaced small, multiple back cushions with long, linear cushions. The seating area is anchored by a shag rug in a large block pattern of white and pale gray, a cozy counterpoint to the stone floor. “Shag is a more casual kind of rug, something people enjoy walking on in bare feet,” Llewellyn says. A wall of glass sliders that forms the back of the room visually expands the space, as well. The glass also ushers in serene views of the pool and gardens. The master suite is hip and spare, with a midcentury modern sensibility. Sugarman and Llewellyn employed the time-honored design tip of combining vintage and designer pieces with furniture of more humble origin. They bought the bed from IKEA. The streamlined side tables are from West Elm. The total effect looks hip, relaxed—and expensive. “Good design is good design, whether it comes from Target or New York City,” Sugarman says. 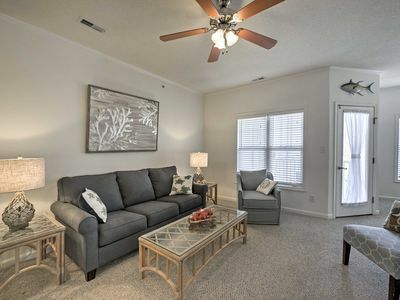 The master bedroom adjoins a private screened porch furnished with a large daybed that can be wheeled outdoors to provide extra seating during large gatherings. In day-to-day life, the porch is a tranquil retreat that offers an intimate connection with the outdoors. Sugarman and Llewellyn envisioned the grounds surrounding the house as a series of open-air rooms. Paxton Holt Jordan, a landscape architecture firm in Milton, designed a California chic setting with an East Coast twist. Flowering crape myrtle and hydrangeas, all in white, mirror the pale palette inside the house. 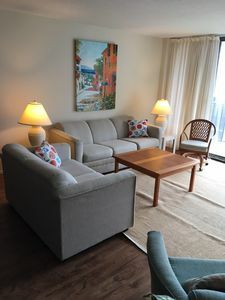 If the oversized settees, chaises and market umbrella on the patio look as if they might be at a resort it’s because they were designed for use at high-end hotels. “Commercial furniture costs a little more going in but it will last much longer because it is made to stand up to constant use,” Sugarman says. A tall hedge buffers the yard from neighbors. A dining table and chairs are stationed in a small grove in the side garden. A hammock is tucked away in a stand of trees in the far corner of the property. Left: The living room doors open to create a seamless connection with the outdoors. Right: The Roman-style pool is ideal for swimming laps. 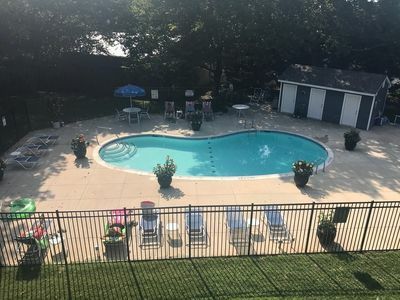 There are pocket-sized patios outside each guest room, allowing visitors to enjoy morning coffee or a nightcap without disturbing others in the house. Each guest room is furnished simply, with a bed, a pair of nightstands and a chair. Flat-screen TVs are mounted on the wall. Storage is provided by built-in cupboards. To keep the tops of the nightstands clear for a book or a drink, pendant lamps are suspended from the ceiling. The architect designed window seats in the foyer, ideal for quiet reading. Beneath the seat, there are drawers for storage. 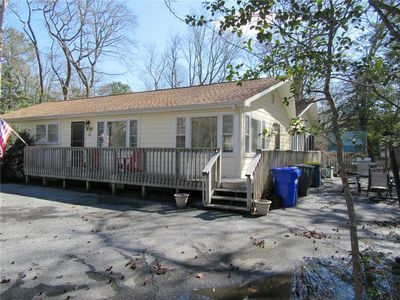 Walk to Rehoboth & Dewey Beaches! Beautiful, Unique, Ocean-Block Home! Steps to the Beach; 5-Star Reviews! 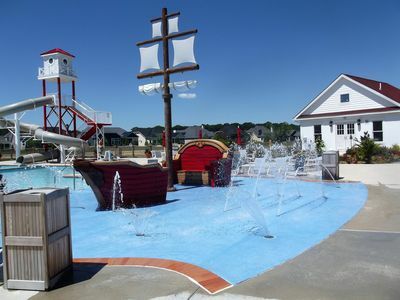 Coastal Club - Indoor & Outdoor Pools, Splash Arena - Pirate Ship & Beach Bus. FREE Activities. It wouldn't matter if it rained all week, you won't mind staying in this gorgeous unit with post card views of the ocean from every room. 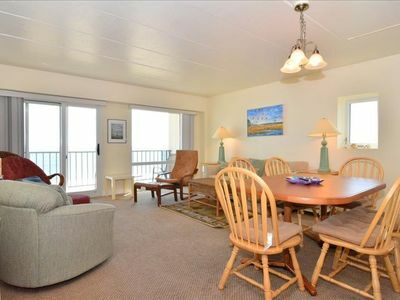 Elegant Coastal Resort Condo Minutes to Beaches! 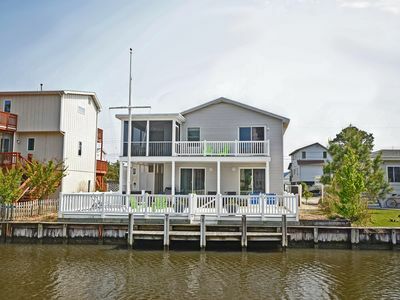 Beautiful home located on the canal and just a short walk to the beach. 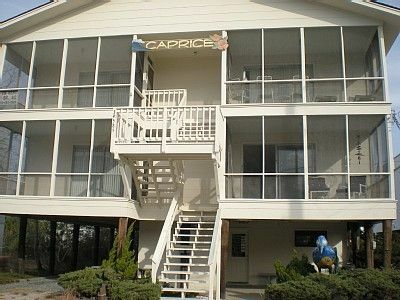 Ocean Front Rehoboth Beach Two Bedroom Condo!